Every now and then, life throws something really exciting across our path that’s worth remembering in vivid detail. Children have a wonderful capacity to remember large volumes of information — especially about things they’ve experienced personally. But as the years go by, those events sometimes fade or get confused amid a lifetime of other memories. One way to help you child cement these events in their mind is to have them narrate to you about what they experienced. Last Wednesday, life threw one of those earth-shaking events into our day … an earthquake centered less than ten miles from our home! Pulling out a small tape recorder the next day, I had my son give an oral narration about the day the earth shook. When he finished telling me about his experience, I replayed the tape and typed up his narration. He’ll add it to one of his notebooks for future reference. Just the process of retelling an event soon afterward can help improve long-term memory. And when my son looks back at this narration years from now, he’ll not only remember the earthquake itself, but also the fact that the earthquake happened the same year he took dance classes, was in Kids Club at church, and Grandpa was in the nursing home recovering from a broken hip and surgery. We were sitting down to watch The Lion King. Mommy thought it was a truck coming by, but it wasn’t a truck. It was the earthquake! We ran down the hallway and went into a door-frame and we saw the cats running all over the house. We heard Daddy say, “Are you all right?” It was scary. It felt like a roller coaster. We heard things falling. Mommy and I went for a drive and we saw a hill that fell apart close to a 7-Eleven and a Jack-in-the-Box and I think there was a hotel nearby. It was a mess. There were these big bricks that had fallen that were under the dirt. You could tell that it just fell over. It made a big mess in the street. There were three or four pipes showing that you could see. A bridge was closed because the bridge railings fell. It was the bridge that we normally take to church. Bill Gates was teaching in Seattle and then the earthquake started and then light bulbs and stuff from the ceiling were falling. There was a big crack in the capitol building. We drove by but we couldn’t see it. 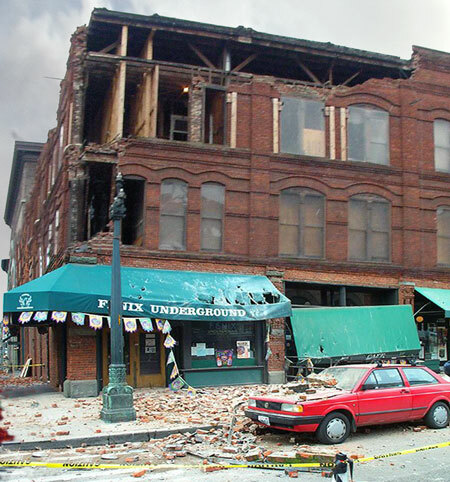 When we were downtown, there was a building that had part of it fallen off from the earthquake. Bricks and tiles were fallen. They had a couple streets closed. At Kids Club at church, the teachers wanted to know some of the things that happened. One of the people said that at first they had a fire drill at school, and then they had an earthquake. They had a fire drill before the earthquake. They thought, ‘Is there anything else that’s going to happen today that will be a problem?’ At Kids Club, we did things differently because of the earthquake. The pastor didn’t know if there would be very many people there. And even if there were, they would probably want to get home. So they shortened it to be about twenty minutes shorter. They had the fourth grade and the second and third grade together. The fifth and sixth grade class was upstairs and we stayed in one room the whole time. We played Dodge Ball. Ballet was closed because of the earthquake. We drove to ballet and because ballet was closed, we went downtown. Then we went to make sure Kids Club was open. We went to visit Grandpa in the nursing home, and then we went to visit Grandma. This entry was posted in Narration. Bookmark the permalink.